Photos of the bodies of several aborted babies were shown to the jury today, each with a gaping wound in the back of their necks, as testimony continued in the Kermit Gosnell murder case. The babies were all intact and had the appearance of being partially mummified or dried. The brownish-black skin had shrunk as it dried, revealing the upper spinal column that authorities say was pierced with scissors in order to snip the spinal cords of newborn babies born alive during abortions by Gosnell. Photos of the remains of Karnamaya Mongar, the woman who died as a result of an overdose by Gosnell’s untrained, unqualified staff, were not shown to the jury due to an objection by Gosnell’s defense attorney Jack McMahon. 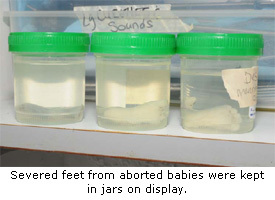 Also shown were photos of babies’ feet in jars, one of which had been severed just below the hip and included the entire leg. A photo of a two-inch foot severed above the ankle was shown next to a ruler. During the display, Gosnell sat attentive but emotionless, sometimes making notes. Other photos taken by a Crime Scene Investigator John Taggart showed the cramped and cluttered maze of rooms at Gosnell’s Women’s Medical Society ‘House of Horrors” abortion clinic. The three story structure has metal poles on the top floor holding up the leaky, decaying roof. The witness indicated that he believes the structure will soon collapse. Pictures were also presented to the jury showing Gosnell’s two large homes, his boat and private boat dock, and his newer model F150 extended cab pickup truck. While his possessions were being displayed, Gosnell smiled broadly and nodded in acknowledgement of his possessions. It is estimated that Gosnell made millions aborting babies while women at his clinic were subjected to the reuse of disposable instruments and other dangerously shoddy practices inflicted upon them by Gosnell and his unqualified, low-paid staff. However, a photo of his gaudy deep purple bedroom at his Philadelphia home was revealing. In it belongings were strewn about and piled everywhere, and appeared much as one would expect a hoarder’s house to look, and resembled the general junky appearance of his abortion clinic rooms. Gosnell had two abortion rooms where he gave poor women abortions that were small, cramped, cluttered, and dirty. They were called the Monet Room and the O’Keefe Room after the cheap painting reproductions that hung in each. Taggart had gathered furniture and objects from the clinic and brought them to the courtroom. Each piece of equipment was identified, including a box of cloudy yellowish plastic disposable cannulas that had been repeatedly reused. A crash cart was present in court that was discovered under a bed in Gosnell’s house. There was no crash cart found inside his clinic. A cannula is the sharp plastic tube that attaches to the suction machine which enters the womb to suction out an early-term baby. It is also used to suction out the amniotic fluid in later abortions and to clean out the remaining tissue after the abortion is completed. Taggart testified that last Friday he returned to the clinic and retrieved one final item which was also in court. It was a large garbage disposal that was under the sink in the wash room that was between the O’Keefe and Monet abortion rooms where jars containing the severed feet sat on a shelf. When asked why the garbage disposal was brought to court, Gosnell’s attorney objected, prompting one of several sidebar discussions out of hearing of the jury. Judge Jeffery P. Minehart, who is presiding over the murder trial sustained the objection and Taggart was not allowed to tell the jury the significance of the garbage disposal. However, the only the two pro-life supporters observing the trial, Day Gardner and yours truly, knew the answer. I had seen it before in the abortion clinic in Wichita, Kansas, that Operation Rescue bought and closed then renovated into a usable pro-life office. Aborted baby remains were likely ground up in the disposal then flushed down the sink. Several members of the jury rose and leaned over to get a better look at the ancient and filthy equipment and furnishings as they were identified by Taggart. Earlier in the day Dr. Karen Feisullin, a practicing ObGyn at a major metropolitan hospital testified that another piece of equipment in the courtroom, the ultrasound machine, was so old that she had never seen one like it. She put on latex gloves before picking up the abdominal and vaginal transducers, which were discolored and filthy. Feisullin testified that she was not even sure where the monitor screen was on the ancient device. Feisullin’s testimony was for the purpose of describing how abortions are done. She serves as an Obgyn at Abington Memorial Hospital in Philadelphia and testified that she does 2-4 second trimester abortions per week, 95% of which are for fetal anomalies. Feisullin described the abortion process in graphic detail, referring to several charts with a pointer to help the jury understand the dilation of the cervix and the dismemberment of the child in the womb during an Dilation and Evacuation abortion, used in the second trimester. She also testified about the process of fetal injection used in later abortions that kills the baby prior to the removal of the remains. Perhaps most damaging to Gosnell of Feisullin’s testimony was her discussion of ultrasound images found in three abortion charts. Each record contained two to three sonogram images showing babies that would have been between 24 weeks six days and 30 weeks gestation. The upper limit for abortions under the Pennsylvania Abortion Control Act is 23 weeks 6 days. She also testified that the ultrasound photos were of such poor quality that she could not see the anatomical landmarks needed to ensure that the measurements of the babies’ heads were accurate. In one case, the measurement of the baby’s head, which determines gestational age, was done in the wrong place making it completely unreliable incorrect. In each case, Gosnell had written in his own had that each baby was 24 weeks six days, no matter how big the heads measured. This was an indication that he did not have an accurate view of the legal abortion limit in Pennsylvania. 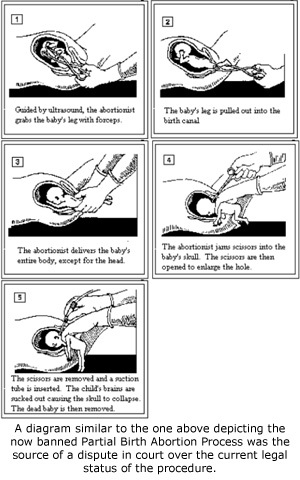 Also in dispute was a diagram of the Partial Birth Abortion process. Partial birth abortions were federally banned after the Supreme Court upheld the law in 2007. McMahon insisted that the process shown in the diagram was still legal while Feisullin testified that it was not. She said she would not use that procedure because it was illegal. McMahon strenuously objected, prompting another sidebar. Gosnell was ushered in and out of the courtroom by Sheriffs Deputies. He has remained incarcerated since his arrest in January, 2011. Upon entering the courtroom for the first time in the morning, Gosnell glanced around the sparsely occupied courtroom and smiled widely at the two pro-life women seated in the gallery. It was my impression from his courtroom demeanor that he did not fully accept that his actions were wrong. 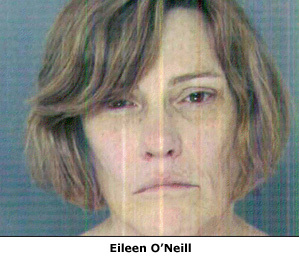 Also on trial with Gosnell is his former staff member Eileen O’Neill, wearing an ill-fitting bright purple shirt. She was seated next to her own attorney who rarely spoke. O’Neill is not charged with murder, but faces several other serious charges, including Theft by Deception for masquerading as a licensed physician, corruption, racketeering, and conspiracy. She is the only one of eight former employees not to have taken a plea agreement prior to Gosnell’s trial. Other Gosnell employees are expected to testify against him in exchange for more lenient sentences, perhaps as early as Wednesday. Testimony is set to continue Tuesday morning. The trial is expected to last for a total of six to eight weeks. If convicted of the charges that he murdered eight newborns and one patient, Gosnell faces the possibility of the death penalty.